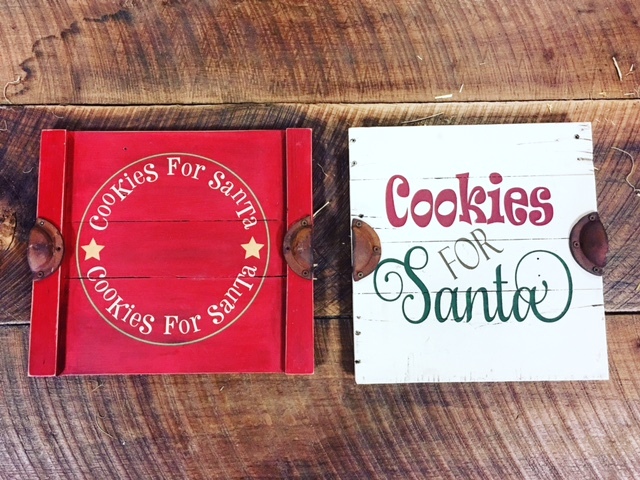 Join us at The Green Door in our DIY Workshop Studio on Friday December 14, 2018 at 6:30pm to create a custom cookie serving tray with your little one just in time for Santa! The trays are handmade out of recycled pallet wood. We will be using Chalk Paint® by Annie Sloan for this workshop; all colors and wax options are available. We will have a variety of hardware to choose from that will be attached to your tray during this workshop. Guests can choose from 2 Cookie Tray designs; please make sure that you choose the correct workshop ticket when you register for this event. If you do not have a child to bring, no worries – make a custom serving tray for yourself! We ask that children under 12 be accompanied by an adult. Workshop Cost: $55.00 • All supplies are included in this workshop. 1 DIY Workshop Ticket Makes 1 Tray. Seats are limited. Sign up today! ALL DIY Workshop tickets are final sale. At The Green Door, we love the uncommon! From handmade items and home decor, to plants, painted furniture and antiques, we welcome all kinds of inspired design into the collection that fills our space. Guests are also invited to join in the creativity with ever-changing, fun and educational DIY workshops— including Annie Sloan Chalk Paint®, terrariums and more! Copyright 2016 The Green Door | All Rights Reserved | Website by Tomahawk Design Co.